The towels for the sea or for the pool are light as a scarf. Elegant cotton and sponge hammam towels elegantly dress your hours of relaxation. Delicati toni turchesi e verde acqua per rilassarsi e pranzare all'aperto, caraffe e mug si adattano alla stagione estiva per succhi e bevande da assaporare sotto l'ombrellone sui comodi tavolini da giardino. 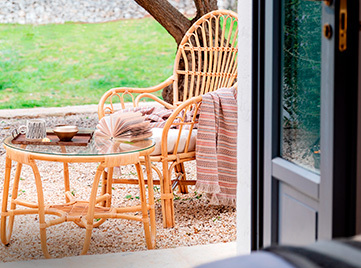 Days get longer, temperatures milder, gardens, terraces, balconies, verandas finally come to life and it's time to think about outdoor and garden furniture . 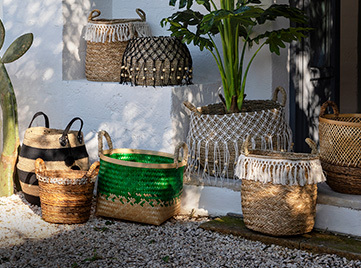 Coincasa proposes an Outdoor collection of garden furniture and outdoor accessories, but also textiles and accessories that are versatile for summer life. 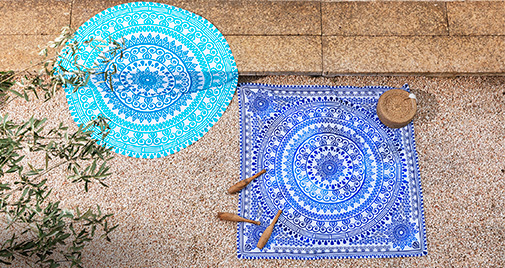 For an outdoor lunch or a dinner in the garden, the water-repellent tablecloths and plastic mats are perfect, in different colors and patterns, easy to maintain. Beautiful like the ceramic ones but much more practical, the melamine plates nice and colorful, the transparent or colored plastic carafes. Inevitable wicker picnic baskets , elegant but practical sets of plates, water and wine glasses, cutlery and accessories, to be placed on a plaid, on a cotton tablecloth , or on a small table coordinated with the folding chairs, comfortable and practical, to recreate all the comfort of home even outdoors. In the garden or on the patio of the house, relaxation is assured by the beautiful hammocks or the comfortable rattan sofas and the garden armchairs < / strong>, coordinated with the coffee tables. The garden furniture is enriched with director's chairs in bright colors, from garden chairs, beds, garden ottomans, futons, pillows and mattresses of all kinds to relax on summer days and in the cool evenings of 'summer. 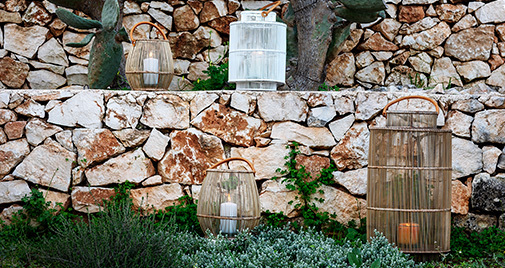 To create a unique atmosphere, outdoor lanterns of different sizes, suitable for any environment; in iron, wood or rattan to illuminate the darkest corners with the soft light of candles. The garden tables and the iron tables are dressed in black and white: optic white, immaculate, which tells of summer and freshness; intense black plays with shadows, with precious and contemporary graphics. Large tables for lunch or evenings with friends, and iron and plastic tables coordinated with the two chairs for a quick coffee. For the garden or for the balcony in the city, wicker and abaca baskets, vases and garden decorations cannot be missing. The colorful curtains and light are a refined separation between the inside and the outside in the season in which doors and windows are opened, while the carpets become unexpected allies to decorate a veranda or a balcony, the sheets furnishings dress in soft sofas and cushions enrich them with marine designs to make you feel at home ... outdoors.